The Levelized Cost of Electricity of lithium-ion batteries and offshore wind have plummeted in the last year, according to new figures from research company Bloomberg New Energy Finance. The Levelized Cost of Electricity (LCoE) measures the all-in expensive of producing a megawatt-hour (MWh) of electricity from a new project, and accounts for the costs of development, construction and equipment, financing, feedstock, operation, and maintenance. It is a helpful, if not entirely comprehensive, measure of the energy wars being played out between old fossil fuel generation sources like coal and gas and new renewable technologies like wind and solar, supported by other energy technologies like batteries. Bloomberg New Energy Finance’s (BNEF) regular LCoE reports are, thus, a handy guide for determining the pace of the war and the lay of the land, especially as we move more fully into a new year. 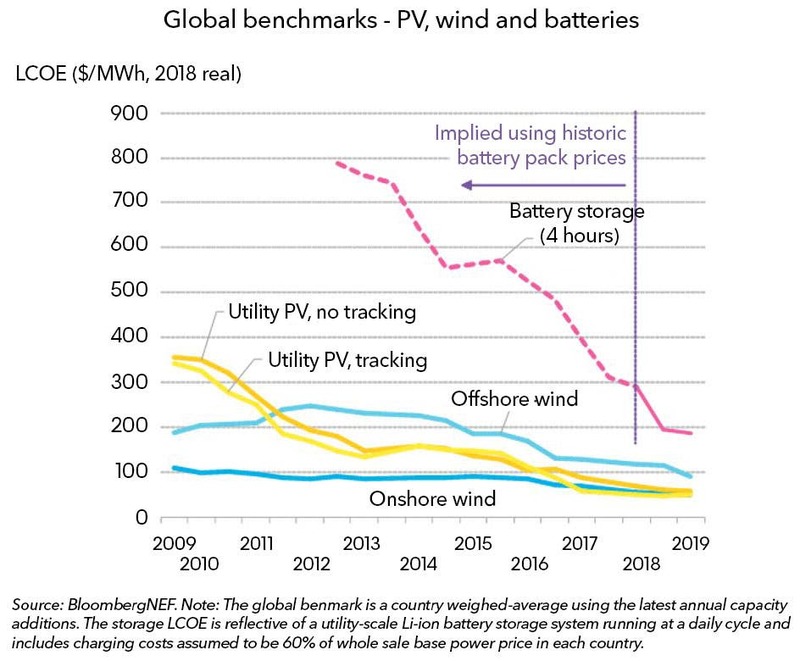 And this latest report is big news for supporters of renewable energy technologies, as BNEF shows that the LCoE of lithium-ion batteries and offshore wind have fallen dramatically in the past year. Specifically, the benchmark LCoE for lithium-ion batteries dropped 35% to $187/MWh while offshore the benchmark LCoE for offshore wind fell by 24% to just below $100/MWh. Onshore wind and solar PV have both also seen their prices fall, though at less dramatic yearly declines, with benchmarks of $50/MWh and $57/MWh respectively (for projects starting construction in early 2019), yearly drops of 10% and 18%. So, while it was good news across the board for renewable energy technologies, the highlight was the dramatic price decline for lithium-ion batteries which, when co-located with solar or wind projects, are starting to compete — in many markets, and without subsidy — with coal- and gas-fired generation projects for the provision of “dispatchable power” (power which can be delivered whenever and as necessary). 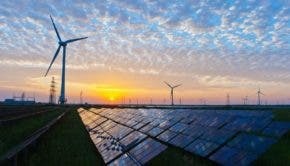 “Solar PV and onshore wind have won the race to be the cheapest sources of new ‘bulk generation’ in most countries, but the encroachment of clean technologies is now going well beyond that, threatening the balancing role that gas-fired plant operators, in particular, have been hoping to play,” explained Tifenn Brandily, energy economics analyst at BNEF. It’s also heartening to see the continual decline in offshore wind costs, and what was once seen as an expensive generation technology is benefiting from the same economies of scale which have supported the solar and onshore wind industries, with benchmark LCoE falling to below $100/MWh as compared to $220/MWh just five years ago.